Welcome to Part 1 of my Wheels and Tires guide. 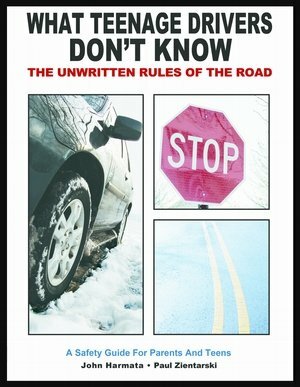 In this section I will discuss how to identify and read tires and wheels, including understanding wheels and how they fit, how to read the numbers and letters on tires, and the importance of choosing the right tires for your vehicle. In Part 2 I will discuss a wheel and tire fitment guide for 2004-2006 Pontiac GTO’s including wheel and tire set up for daily driving, drag racing, staggering, and lowered vehicles. Even though this guides main focus is on the 4th generation Pontiac GTO, this guide can be a great reference for any vehicle. 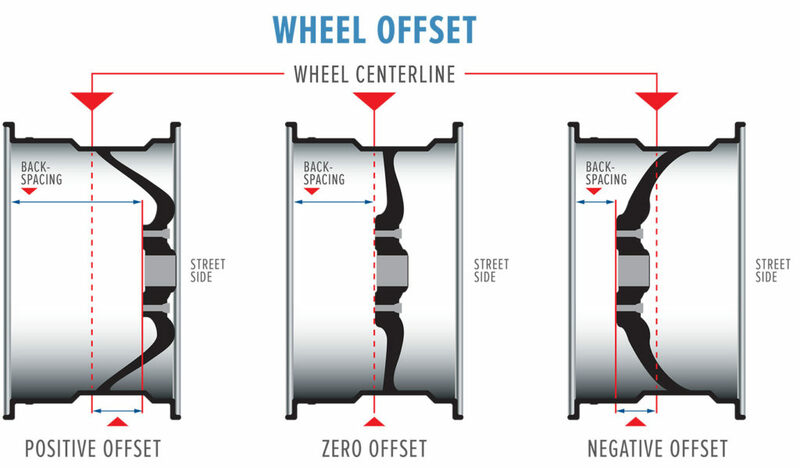 The information below is universal and is used by every wheel and tire company around the globe. Tires and wheels is an often talked about subject. Most Pontiac GTO owners, and most car owners for that fact, want to know which tires and wheels they should put on their vehicle. Depending on what you are looking to accomplish, those questions will vary. Car enthusiasts will often look for wider tires, lower profile tires, tires that fit over sized wheels for the “large” rim look, and more. Maybe you just want a better performing tire for all weather conditions and/or less road noise, or a tire that really sticks to the pavement to handle higher horsepower vehicles. What ever your needs are, I am going to do my best to try to answer all of these questions. For the guide below, I have compiled the best information I could find across the web using various sources to bring you the best possible information on the subject to one page. If you have any further questions or comments, or would like to add more information to this subject, please leave a comment below or use the Contact form found here. To get started, lets look at what tires and wheels comes stock from the factory for the 2004-2006 Pontiac GTO. Now the big question, what do all those numbers mean? The bigger the diameter, the bigger the wheel. Easy right? The width of the wheel is measured across from bead seat to bead seat. Accurate wheel width measurement is done with the wheel only, no tire mounted. Measurement does not include the outer lip of the wheel. Measure the inside of the wheel lip where the tire will seal to the rim on the inside of the wheel outer lip. This measurement is usually done in Imperial measurement of inches. A few wheel companies may use the metric system of millimeters which can easily be converted to inches and vice versa. 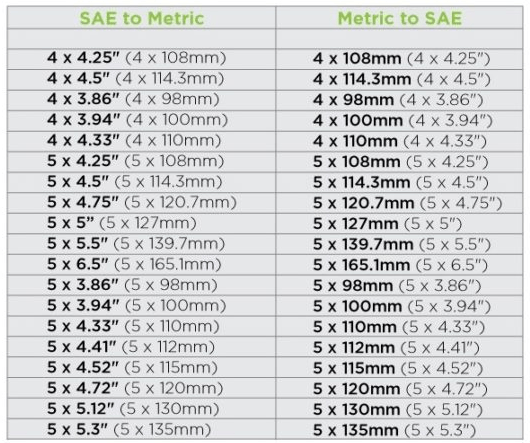 Use the conversion tables below to convert inches to millimeters or millimeters to inches. 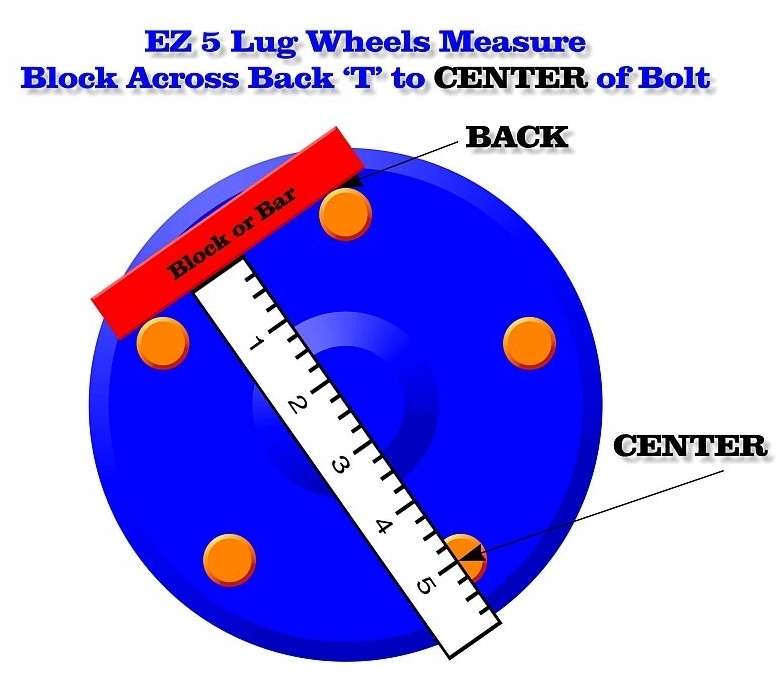 See the diagram below to view how to measure wheel width. The wider the wheel width, the wider a tire you can put on the wheel. Piece of cake right? Wrong! Keep reading. The 2004-2006 Pontiac GTO uses A 5x120mm bolt pattern. There are many wheel companies that make this bolt pattern. Only use wheels with the correct bolt pattern for your vehicle. Only use the 5x120mm bolt pattern on your 2004-2006 Pontiac GTO, unless a different or after market wheel hub was installed which uses a different bolt pattern for the application. So now that we know what offset and back spacing are, things should be starting to make sense. Finally, time for the fun stuff, tires! Tires come in all sorts of styles and sizes. Choosing a tire depends on what you want to use it for. Do you need an all season tire that can be used in all kinds of weather conditions, or are you looking for a summer tire that really sticks to the road? Maybe you need a lower profile tire because you want to run over sized wheels. There is also the tires racing enthusiasts choose, drag radials and slicks. Whatever your needs are, I’m going to do my best to try to explain what you should be looking for. Very first thing you need to know is what size wheel do you have. The 4th Generation Pontiac GTO comes with either 17″ (inch) or 18″ (inch) wheels from the factory. Now we need to know how to read the different tire sizes. Wheels are only capable of holding a tire wide enough to safely create a seal between the tire and wheel bead so the tire can hold air safely as well as staying securely on the wheel. So if you are thinking of putting some super wide tires on that factory 8″ (inch) wide wheel, think again. 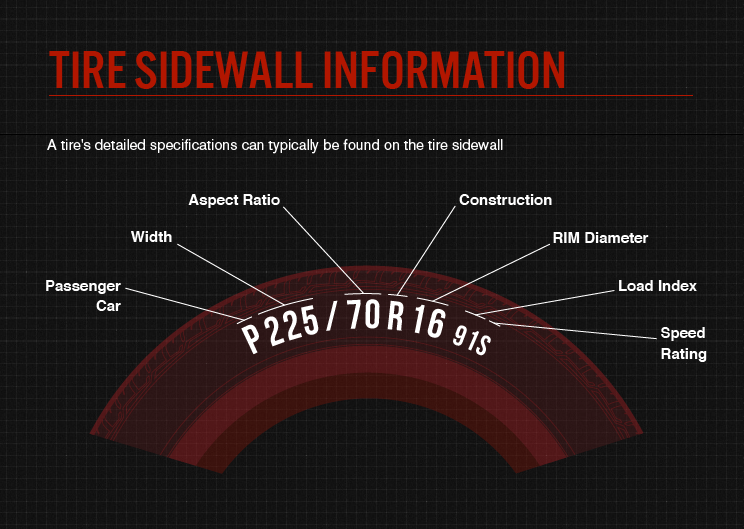 Next is the profile of the tire, the second number. Your car has only so much tire clearance to fit the wheels and tires inside the wheel well. Too tall a tire and you will have your tires rubbing against the wheel wells as well as the body of the vehicle, especially the front wheel when you turn, and the back wheels when you hit a bump in the road and the suspension compresses. Suspension travel and wheel travel must be taken into consideration to give your wheels enough breathing room. You may have noticed in my above example of tire size 245/45R17, there is a letter separating the second and third tire size measurements. The “R” stand for Radial Tire. The letter “R” is pretty much an industry standard now since all street tires are radial tires. The only time you may see something different is possibly if another letter comes before the “R”, such as 255/40ZR18. The letter “Z” is added to show the tire is a “Z” rated tire which means the tire is capable of speeds up to 149 miles per hour without tire failure. This is mostly done for show since all tires have a load and speed rating after the tire size. Which brings us to our next lesson, speed rating of tires. The tread of a tire are the patterns molded into the tire to help disperse water and debris to gain traction to the road. While driving, water and debris are pushed to the canals of the tire tread and literally pushed out from under the tire, allowing the tire to safely make contact with the road giving the tire more traction. Hydroplaning can occur when your tires lose traction to the road and slides on a wet surface. When your car begins to hydroplane, the tires are no longer making contact with the road and your vehicle is literally driving on water, snow, ice or whatever other wet surface your tires have made contact with. Tire tread can help prevent “hydroplaning” on wet surfaces. You may notice tires have many different tread patterns carved into the tire. Yes, there are differences in tire tread. Not all tires are designed for the same weather conditions. All season tires are designed as the name says, all weather conditions, but other tires may be designed strictly for rain, snow, or dry weather conditions. There are many different tread patterns available, and choosing a tire with the proper use is extremely important. 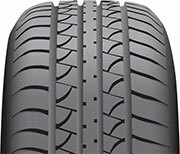 Keep reading to see the descriptions and explanations of different tire tread patterns. Symmetrical Tread – A symmetric tread pattern is the most common. It uses continuous ribs or independent tread blocks across the entire tread face, that often create a wavy design. The pattern on each side of the center is the same. These tires can be rotated from front to back or side to side, and can be installed onto the wheel with either side facing inside or outside. Symmetrical tread tires will give the least amount of road noise and have the longest tread life. This tread pattern is mostly used on all season and snow tires. Asymmetrical Tread – Asymmetric tread patterns combine the features of other tread designs for equally strong dry and wet performance. On an asymmetric tread you will find larger tread blocks on the outside to create a bigger contact patch for cornering grip. This also helps reduce tread squirm for better stability, and breaks up heat build up. The outside also features large lateral grooves designed to disperse water out the side of the tire. The inside features smaller, independent tread blocks and smaller grooves to increase contact area and improve grip. On an asymmetric tread tires the sidewall will have ‘inside’ and ‘outside’ markings so you know which way they need to be mounted. 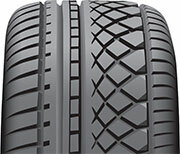 This tread pattern is used on all weather tires and performance tires. 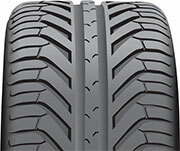 Directional Tread – Directional tires are designed with the tread pattern angled to point in one direction. The tread design is typically V-shaped and is more resistant to hydroplaning. The tread blocks are molded diagonally to push away water from the contact patch more effectively. Directional tires cannot be rotated from one side of the vehicle to the other side, they can only be rotated front to back – which can often lead to more road noise as they wear. On the sidewall there is an arrow pointing out the tire rotation direction. These tires must be mounted going in this direction. You can not rotate these tires from side to side. You can rotate the tires from from to back, only if the front and back tires are exactly the same size. If you are running two different tire sizes on the front and back wheels, the tires can not be rotated. This tread pattern is used on performance tires. Directional tires are by far my favorite and the tires I highly recommend for sports cars. Insert a penny into your tire’s tread groove with Lincoln’s head upside down and facing you. If you can see all of Lincoln’s head, your tread depth is less than 2/32″ of an inch and it is time to replace your tires. Yes, there’s a catch to how long your tires will last. Most higher speed rated tires are made for summer use only, meaning warm and dry driving surfaces only. High performance tires will grip the road better, corner better, and improve overall handling, but usually do not handle well in rain or snow. The higher the performance of the tire, the softer the compound of the tire, and they will wear out much faster. The softer the compound, the stickier the tire will be to warm dry surfaces. Drag radials and slicks for instance are very soft compound tires. They are designed for warm, dry conditions only. The draw back is, these tires wear very quickly because of the soft sticky compound they are made of. On the other hand, an all season radial tire is made of a much harder compound, and will last much longer. 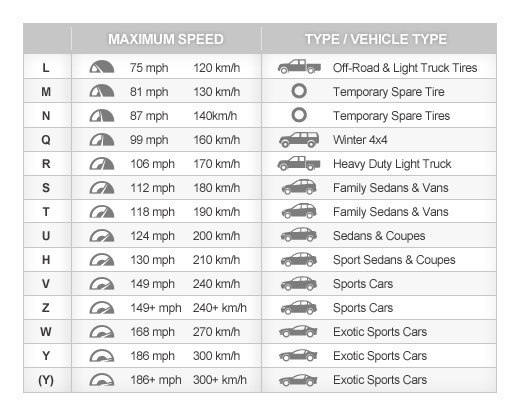 Choose a tire based on your driving conditions. All season radial tires are the most popular and most sold tire on the market. All season radial tires can be driven in both wet and dry conditions. Summer tires can only be used on dry surfaces. If you only drive your vehicle in summer or warm dry conditions, a high performance tire may be a much better tire for you. Never drive a vehicle with summer tires in snow or icy conditions. Never drive with drag radials or slicks in the rain. One of the most over looked aspect of tires is tire air pressure. Properly inflated tires will give you the best traction to the road, the best fuel economy, and overall make your vehicle safer to drive. Improperly inflated tires will also make your tires wear out faster. Over inflated tires will create less tire in contact with the road which will create less traction as well uneven tire wear. The center of the tire will be making contact while the outer portions of the tire (both inside and outside) will not being making contact with the road. Under inflated tires will make much more of the tire contact the pavement, but the negative result is more drag and lower fuel economy. The tire will also lose its shape and form and wear the tire out much faster. Under inflated tires will also cause a rougher ride and not handle and corner around turns as well as a properly inflated tire. 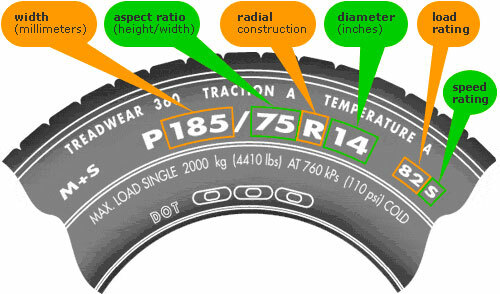 Tire pressure is measured by “psi”, pound per square inch. 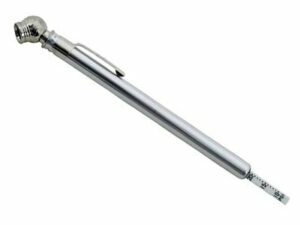 A tire pressure gauge is used to check the air pressure inside the tire. There are many different styles of tire pressure gauges on the market, and to be honest, they all do the same thing. Some tire shops will offer to fill your tires with Nitrogen rather than air. Why would you do this you ask? Nitrogen is used in tires for racing. Nitrogen is less likely to migrate through tire rubber than is oxygen, which means that your tire pressures will remain more stable over the long term. Racers figured out pretty quickly that tires filled with nitrogen rather than air also exhibit less pressure change with temperature swings. That means more consistent inflation pressures during a race as the tires heat up. And when you’re tweaking a race car’s handling with half-psi changes, that’s important. Fortunately in the real world, Nitrogen is not needed. Regular air fills the tires up just fine, and if you are planning on going 200 miles per hour around corners on the streets, please stay out of my neighborhood. Just use air in those tires. All the nitrogen does is prevents any water from getting inside your tires. Compressed air does have moisture in it, a very small amount of moisture if its a good air compressor. Not to mention air from air compressors is 78% nitrogen. If you feel there is too much moisture in your tires, press on the air valve, release the air until you feel no more moisture coming out, and fill it back up with air from a quality air compressor. So have I left anything out? With all the above information you should know everything there is to know about tires and wheels. 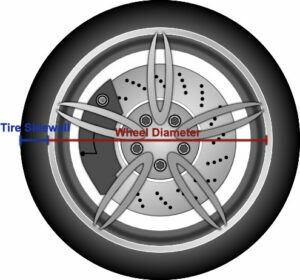 How to identify your wheel size, how to read what size tires you have, and the importance of choosing the right wheel and tire combination for your car. But is that it you ask? The answer is NO, there is more. Each tire manufacturer may have a different circumference for their wheels, even though the tires may be the exact same size. This means some tires may sit slightly higher or lower under the wheel well, depending on the brand of tire you are using. The difference could be as small as 1/2″ (half of an inch) and as much as 1″ (inch), but for you car owners with lowered vehicles, that 1/2 of an inch can make a world of difference. This is why it is always recommended to use matching tires on the front and rear of the vehicle. I can already picture the scenario for all the 2005-2006 Pontiac GTO owners who are sick of riding on those skinny 235/40/18 tires on the back of your cars. You are thinking, “Hey, I’ll just put a set of 255/40/18 on the back wheels and nothing will change!” WRONG! With wider tires, you also gain a bigger overall tire circumference. 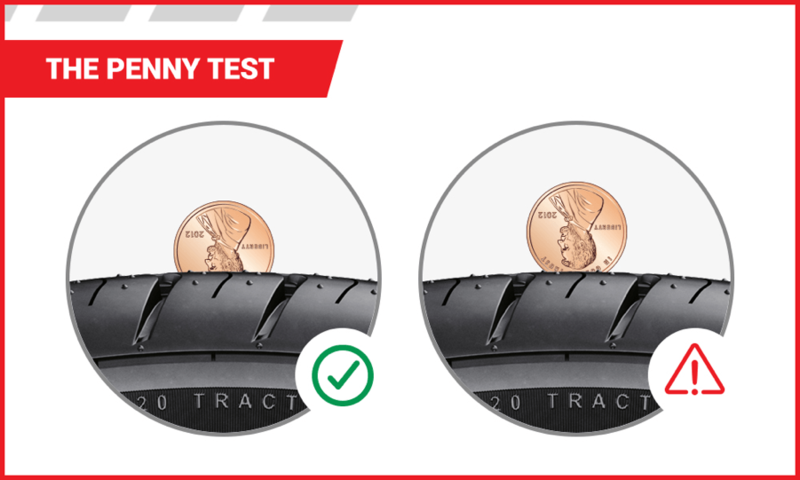 TAKE THE TEST – For this test we are going to use the same aspect ratio (profile) and same size wheel, but change the width of the tire. Use these numbers on the Tire Size and Conversion Calculator website link below: Type in under “Current” 235/40/18. Type in under “New” 255/40/18. The link below will open in a new window. Keep both windows open to compare your notes to mine. As you can see, the sidewall on the new tire is slightly taller, you are gaining more section width (amount of tire to the pavement), but the big difference is the tire height. Our new tire is over 1/2″ (half an inch) taller than our original tire. And also gains over 2″ (inches) of overall circumference. Also your speedometer will change a bit, but only by 1.6 miles per hour. Knowing this new information, your vehicle will sit slightly different. More importantly, can your suspension handle the change with now less room between the tire and wheel well? The simple solution of course is to drop down to 35 profile tire, 255/35/18, which will give you plenty of wheel clearance and still gain a wider section width to the pavement. 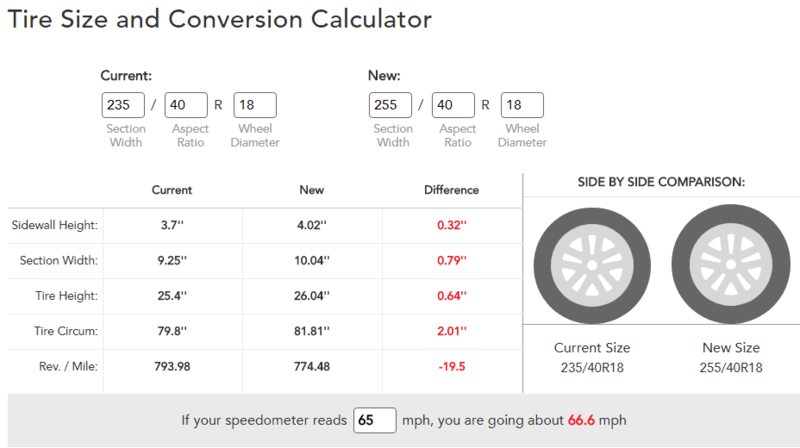 For the purpose of this exercise, I just wanted to prove there is a change in the tire when using the same profile measurement when moving to a wider tire. This test is especially important for lowered vehicles. Know how much room you have to prevent wheel rub. 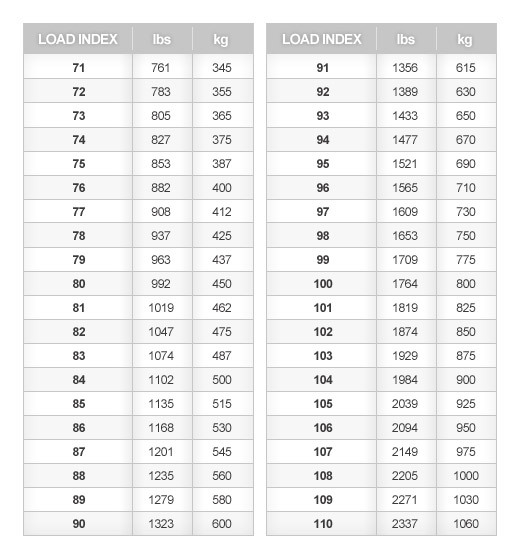 Use the tire size calculator above to determine how much space you will lose or gain when switching to different tires. So now that you have all this information, you are probably wondering if I offer a fitment guide for 2004-2006 Pontiac GTO’s. What wheels to buys, which tires to buy, what is the best size tire, what is the widest tire I can use, and I’m sure a few other questions. The answer is YES! I will be releasing a Part 2 for this tires and wheels sections, because honestly, it’s just too much information to put on one page. Stay tuned…….